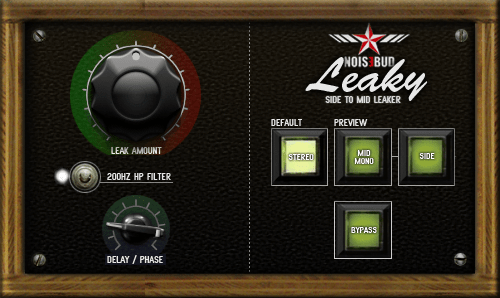 Leaky will let you leak the side information into the mid channel. It can be useful while mastering if parts of the audio almost disappear in mono. REMEMBER: Taking the track back to the mix should be your number one choice, tricks like this should not be used if not absolutely necessary! If the vocals (or a solo instrument) in a track feels to dry in mono because most of the reverb exists in the side channel. The track is mixed with an abused Voodoo Stereo-imager and that phat synth lead before the drop magically disappears in mono. Most of atmosphere of the whole track is placed in the side and totally get lost while in mono. The bass is out of phase; place Leaky first and drive it hard. Use a mid/side EQ and filter out the bass from the sides.